Definition at line 35 of file ReachingDefAnalysis.h. Definition at line 75 of file ReachingDefAnalysis.h. References llvm::PassRegistry::getPassRegistry(), llvm::initializeReachingDefAnalysisPass(), and releaseMemory(). Definition at line 80 of file ReachingDefAnalysis.h. References llvm::MachineFunctionPass::getAnalysisUsage(), runOnMachineFunction(), and llvm::AnalysisUsage::setPreservesAll(). Provides the clearance - the number of instructions since the closest reaching def instuction of PhysReg that reaches MI. Definition at line 191 of file ReachingDefAnalysis.cpp. References assert(), getReachingDef(), and MI. Referenced by llvm::createBreakFalseDeps(), and getRequiredProperties(). Provides the instruction id of the closest reaching def instruction of PhysReg that reaches MI, relative to the begining of MI's basic block. Definition at line 172 of file ReachingDefAnalysis.cpp. References assert(), llvm::tgtok::Def, llvm::MachineBasicBlock::getNumber(), llvm::MachineInstr::getParent(), llvm::MCRegisterInfo::DiffListIterator::isValid(), llvm::max(), MI, and llvm::SmallVectorBase::size(). Referenced by getClearance(), and getRequiredProperties(). Definition at line 87 of file ReachingDefAnalysis.h. References getClearance(), getReachingDef(), MI, llvm::MachineFunctionProperties::NoVRegs, and llvm::MachineFunctionProperties::set(). Definition at line 165 of file ReachingDefAnalysis.cpp. Definition at line 133 of file ReachingDefAnalysis.cpp. 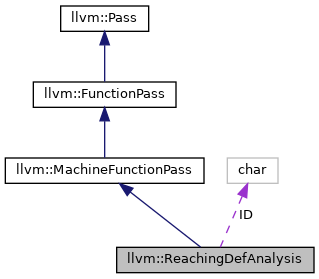 References llvm::dbgs(), llvm::MachineFunction::getFunction(), llvm::MachineFunction::getNumBlockIDs(), llvm::MCRegisterInfo::getNumRegUnits(), llvm::TargetSubtargetInfo::getRegisterInfo(), llvm::MachineFunction::getSubtarget(), LLVM_DEBUG, llvm::SmallVectorImpl< T >::resize(), llvm::FunctionPass::skipFunction(), llvm::sort(), and llvm::LoopTraversal::traverse(). Definition at line 73 of file ReachingDefAnalysis.h.